Defining the scope of a growing public health issue. Nearly 20 percent of the U.S. population are shift workers who go to work during the hours between 10 p.m. and 6 a.m.1 Studies have shown that Shift Work Disorder (SWD) affects between 10 and 38 percent of these workers whose work/sleep schedule is misaligned. In addition to core symptoms of excessive sleepiness and/or insomnia, shift workers are at greater risk for chronic diseases such as high blood pressure, metabolic disease, gastro-intestinal disorders, and certain cancers.2,3,4,5 Since SWD remains significantly underdiagnosed and rarely addressed, it poses a significant public health problem. To help improve the primary care clinicians’ ability to diagnose and treat SWD, a team of experts chose the DecisionSim™ simulation platform due to its ability to improve knowledge and enhance decision-making in an engaging, effective and efficient manner. Additionally, the experts were interested in analyzing the rich data produced by the simulation to help them better understand current clinical practice behavior and clinical decision-making. The team was led by Ardgillan Group LLC, an educational consulting firm with expertise in sleep medicine, along with Dr. Paul Doghramji, MD, FAAFP and primary care physician and Christopher Drake, PhD, a leading sleep researcher with the Henry Ford Medical Center. This simulation was supported by Teva CNS and certified for Continuing Medical Education (CME) credit by pmiCME. It was distributed via pri-med.com, one of the largest online CME providers in the U.S. After 6 months online, approximately 2,000 clinicians had taken part in the simulation. DecisionSim helps clinicians correctly diagnose and treat SWD. Leveraging the intuitive DecisionSim authoring tools, the team designed a branched simulation with a discovery learning design to help primary care clinicians improve their diagnosis of SWD. In the simulation, clinicians are presented with Christina, a 45-year-old female who goes to her primary care physician for a regular annual check-up. The clinicians have the opportunity to explore her complaints of tiredness, depression, changes in her menstrual cycle, and weight gain. Throughout the simulation, the learners were required to make decisions that provided insight into the primary care clinician’s experience, knowledge, competence, and performance in the assessment and diagnosis of SWD. 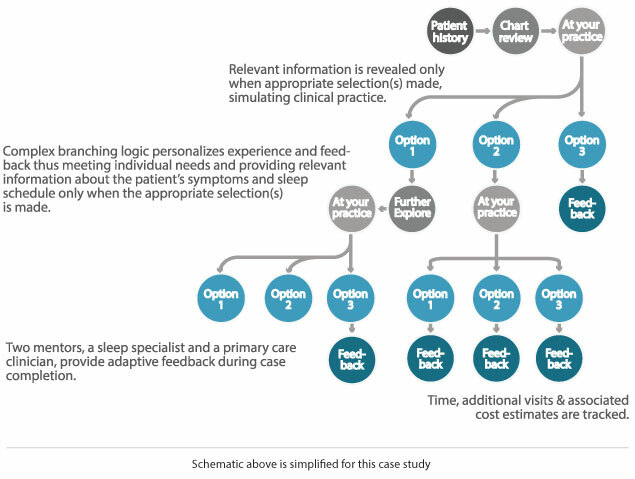 As in a real clinical situation, relevant information was revealed only when appropriate selections were made in the simulation during the patient history and chart review phase. “This simulation reflected real life practice. Most patients don’t come in with a diagnosis, but rather say ‘I am tired.’ This is a symptom-based problem, so we should teach it that way. We often have to extract information from our patients,” said Dr. Doghramji. The simulation unfolds based on the each learner’s choices. If the learner makes poor choices or misses a key decision, personalized feedback is provided to allow them to progress in the simulation. Drs. Doghramji and Drake, as mentors, guide the learners through practical ways to assess SWD in the primary care setting and provide adaptive feedback throughout the simulation. DecisionSim collects detailed information on each decision made by learners, the order in which they make the decisions and even the time it takes to make a decision. In this simulation, the data set included over 48,000 relevant decisions that were based on the clinical context provided in the simulation. From this data, the educators could identify the learners’ decisions and their paths through the simulation. Selected outcomes and clinical insights gained from the SWD DecisionSim simulation were presented at the annual meeting of the Associated Professional Sleep Societies and the abstract was published in a supplement to the medical journal SLEEP. SWD is Underdiagnosed in Primary Care. A staggering 49 percent of the clinicians that used the simulation, which included physicians, nurses, physician assistants, and pharmacists, reported that they have never diagnosed any patient with SWD even though a growing percentage of their patients struggle with it. Familiarity With Sleep Scales and Tools is Low. The data also revealed that 51 percent of learners were unfamiliar with proven assessment tools such as the Epworth Sleepiness Scale. Interestingly, although 64 percent correctly chose sleep hygiene as a primary management strategy for Christina, either alone or in conjunction with medications, 25 percent of them reported that they were, in fact, unfamiliar with sleep hygiene principles. Tiredness May Not be Explored as a Priority. For a disorder of sleep timing, the authors discovered that in taking a sleep history, the questions relating specifically to the timing of sleep were least popular. Thirty-nine percent of participants omitted those questions prior to correction with adaptive mentor feedback.